On these rain-swept islands in the North Atlantic man and fish go back a long way. Fish are woven through the fabric of the country's history: we depend on them - for food, for livelihood and for fun - and now their fate depends on us in a relationship which has become more complex, passionate and precarious in the sophisticated 21st Century. 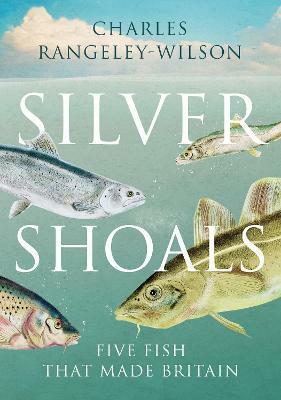 In Silver Shoals Charles Rangeley-Wilson travels north, south, east and west through the British Isles tracing the histories, living and past, of our most iconic fish - cod, carp, eels, salmon and herring - and of the fishermen who catch them and care for them. In the company of trawlermen, longshoremen, conservationists and anglers Charles goes to sea in a trawler, whiles away hot afternoons setting eel nets, tries to bag his first elusive carp and drifts for herring on Guy Fawkes night as fireworks starburst the sky. Underscoring this journey is a fascinating historical exploration of these creatures that have shaped our island story. We learn how abundant and valued these fish were centuries before our current crisis of over-fishing: we learn how eels built our monasteries, how cod sank the Spanish Armada, how fish and chips helped us through two World Wars. Of course there is a deeper environmental dimension to the story, but Charles' optimistic perspective is this: no one is more invested in fish than the fishermen whose lives depend on them. If we can find a way to harness that passion then the future of fish and fishermen in Britain could be as extraordinary as its past. "Rangely-Wilson, an angler and East Anglian, reconnects us though this enjoyable fish-catching pilgrimage to the vast plenty of herring, cod, eel and salmon that once existed around Britain's shores and in our rivers; a plenty which can return to a significant extent if more people are conscious of that past, understand its lessons and take the common-sense steps necessary to bring abundance back again." Charles Rangeley-Wilson is an award-winning writer. He is a passionate conservationist, founder of the Wild Trout Trust and the Norfolk Rivers Trust and advisor to WWF on English chalk streams. He is the author of two books of travel and fishing writing, Somewhere Else and The Accidental Angler, which was also televised by the BBC, and Silt Road: The Story of a Lost River. His other work for the BBC includes the critically acclaimed film Fish! A Japanese Obsession. He lives in Norfolk with his wife and two children.